Easthouse's progressed to the Quarter Finals of the John McConnell Memorial Cup after a goal fest against a brave Craigroyston side. 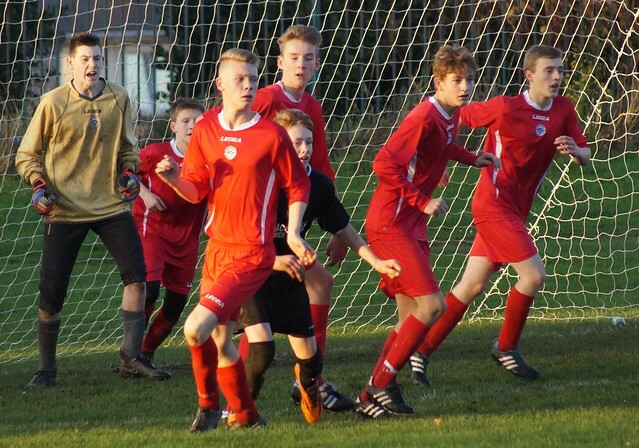 The visitors could have easily just forfeited the cup tie when their squad was depleted with last minute call offs and no shows which left them only being able to field ten players but to their credit the Craigie lads wanted to go ahead and play the game. This cup tie was effectively over after thirty minutes but Craigroyston could be proud of their efforts at the full time whistle. The home side kicked off and the first half chance of the game fell to Craigroyston when they were awarded a indirect free kick one minute into the game on the left hand side about 23 yards out. Matthew Delworth stepped up but his long ball into the box floated out harmlessly at the back post. Easthouses opened the scoring with only three minutes on the clock when Reece Wyllie latched onto a loose ball 10 yards out and found the right hand corner with his finish. Wyllie was involved in several of Easthouses next chances when after wriggling about in the box with the ball at his feet he managed to get his shot away five yards out which saw Omid Partovi having to react quickly to save low down. Then Wyllie became creator when he played the ball out to Michael Sargent and his cross come shot was fumbled by the Craigie keeper but he collected at the second attempt. Joseph Queen was causing all sorts of problems for Craigroyston with his pace down the right hand side and this led to a good chance for Sargent to double the lead but he just was inches away from making contact at the back post from Queen's cross. 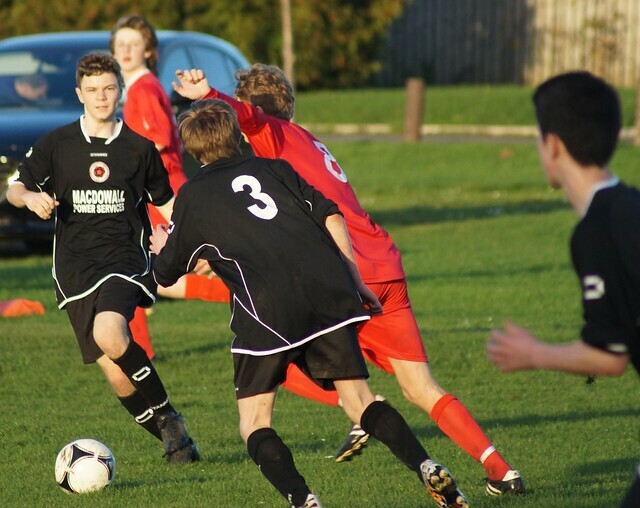 Craigroyston were working extremely hard in defence and Delworth made a super tackle to halt another Easthouses attack. The home side increased their lead on 11 minutes when Queen again used his pace down the right side and crossed a long ball into the back post area and this time Sargent made no mistake and headed home from a yard out. Partovi came to his Craigie's rescue when he got down to save Morgan Rutherford's shot from six yards out. It was all one way traffic towards the Craigroyston goal and with the home side's pace all over the field especially down the flanks they looked to hit the visitors on the break at every opportunity. Sargent now became the provider for Queen to get in on the goal scoring when he played a perfect weighted ball into Queen path and from the right hand side of the box he fired the ball into the left hand corner in the 22nd minute leaving Partovi with no chance. Craigroyston's heads never went down and Craigie's Stuart Ainslie tested Anderson really for the first time in the game with a good strike but the keeper made a good stop. Wyllie got his second and Easthouses fourth when Partovi saved well with his feet from the initial Easthouses shot but the ball was picked up 20 yards out by Wyllie who played a lovely ball over the top of the advancing defenders and keeper to find the back of the net with 24 minutes gone. The Craigroyston keeper was a a busy man and was called into action again firstly saving well from Daniel Gallacher then saved brilliantly a from Wyllie who after latching onto a long ball tried to lobe Partovi who done well to collect the ball above his head. Cole Allen looked like he would be next to test Partovi but the two Craigroyston centre backs did well to combine to stop his advancement but it was not long before Partovi was having to pick the ball out his net again. The match was over as a contest just after the half hour mark when Gallacher got in on the act for Easthouses and finished well directing his shot into the left hand corner. Many side's would have just crumbled but not Craigroyston's ten men and they got their reward for their efforts when Kyle Collins got a goal back for the visitors firing a powerful low driven shot across Anderson into the far corner. Unfortunately Craigroyston's joy did not last long as straight from the restart Sargent picked up the ball and drove down the left channel and played in a wonderful low driven cross which Wyllie side footed into the net from four yards out to claim a first half hat-trick. A long ball played forward by Craigie saw Anderson having to be alert to get out to clear the ball before Ainslie got there. Morgan Rutherford created a good scoring opportunity but put his shot wide but made up for it right on half time when he picked the ball up from midfield and after driving in on goal calmly slotted the ball past Partovi. Craigroyston got the second halve underway and with Easthouses making three half time changes it was all about pride for the visitors. Easthouses were now playing up the slope but this did not stop them kicking on when Ryan Loy took the ball round the outside of the keeper and his cross into the box was headed clear by Leon Charlton with Morgan Rutherford behind him ready to pounce on any mistake. Loy then tried his luck 25 yards out but Partovi saved comfortably. Craigie then saw Ainslie playing a good cross into the box but Ryan Watson headed out for a corner, the resulting corner was then cleared up field. Morgan Rutherford was having a cracking game in midfield and was creating a lot for the home side and he played a delightful through ball for Loy but Delworth got there first to clear the danger. Craigroyston back line were working extremely hard and were keeping Easthouses at bay and it was Charlton again mopping up at the back to clear followed by Delworth who halted Wyllie in his tracks and then cleared his lines. Easthouses were relentless and just kept pushing forward and Samuel Rutherford played in Loy who put his shot wide then Partovi was called into action when he superbly tipped Loy's fierce shot round the post for a corner. Morgan Rutherford should have increased his side's lead but somehow managed to blast the ball over the bar from only four yards out. Craigroyston were still working hard and trying to play football and Ainslie slipped a lovely ball through to Conrad Cinar but unfortunately it was just a bit heavy and Anderson came out and claimed the ball. The home side's pressure finally paid off on 52 minutes when Sargent picked up the ball on the left and his cross was met by Wyliie to claim his fourth of the game when he headed into the top right hand corner. Partovi was called into action again and made a fine save from Wyllie's strike 20 yards out and then after a good move involving Morgan Rutherford and Samuel Rutherford they set up Aiden Young who saw his shot squirm under Partovi's body and then pop out at a funny angle into the right hand corner of the goal with 25 minutes of the game still to go. Craigroyston came close when James Tipton drove in on goal and his shot was deflected into the path of Ainslie running in at the far post but just could not get the touch required and the ball went out for a goal kick. The game was now a battle between the Easthouse's forwards and Partovi in the visitors goal and it was Partovi who was coming out on top time after time. Firstly Morgan Rutherford played in Loy who saw his shot rebound of the bottom left hand post and back into the grateful hands of his nemesis. Then the visitor's keeper pulled of the save of the game with a acrobatic effort to stop Allen getting on the score sheet. After all his heroics the Craigroyston keeper once again found him self beaten in the 62nd minute when Samuel Rutherford played in Wyllie who saw his shot saved but all Pavoti could do was push the ball out and it was Loy who reacted the quickest to blast the rebound home from 8 yards out to finally get the better of the impressive Partovi. Craigroyston's Delworth stung Anderson's fingers after an extremely audacious effort from a free kick just inside his own half which was finding the top left hand corner until Anderson tipped it over the bar. Samuel Rutherford was next to try his luck when he broke into the Craigroyston box but a brave Partovi came out and saved at his feet injuring himself in the process but after a couple of minutes he was back up on his feet ready to continue. Easthouses thought they had increased their lead with 15 minutes to go when Wyllie saw his shot saved but Loy followed in to blast home from four yards out. The celebration was cut short though when the referee gave off side against the goal scorer. It was not long again before the home side showed their displeasure towards the official when Samuel Rutherford was on the end of a disputed off side call. Queen was next to try and get the better of the visitors goal keeper who was having a superb game between the sticks regardless of the scoreline but again Partovi came out on top blocking his shot and Delworth cleared the danger. A minute into added time and Samuel Rutherford eventually got the goal his second half performance deserved when he after driving in from the right hand side found the far corner to complete the scoring in this enthralling cup tie. Easthouses were well worthy of their win on the day and will be looking forward to the quarter final draw but the ten men of Craigroyston can hold their heads high and should be proud of their hard work, determination and bravery shown in this cup tie. Reece Wyllie does not get this award just for his four goals but also for his work rate and willingness to play in a team mate who is in a better position than himself. A good all round team player. Omid Partovi is given this award as he had a superb game especially in the second half. A very agile keeper who pulled of two top class saves and many more quality saves to thwart Easthouses time and time again. a keeper who is brave and willing to put his body on the line for his team. Reece Wyllie's 35th minute goal to claim a well deserved first half hat-trick. Omid Partovi's acrobatic save to stop Allen scoring. Rory Allen, coach of Easthouses Fc said: "I thought the game was played in a good spirit for a cup tie. We played really well and the pace that we had in the team and the football we played at times was absolutely superb. We kept the high tempo going right through out the game. A special word for the Craigroyston goal keeper who had a stormer of a game and would have been a lot more if not for him. A well deserved win and a really good performance." John Paul Cloke, coach of Craigroyston, said: " It was a tough game today as we came with only ten men and we always knew it was going to be tough but the lads wanted to come up and play the game. We seen a big improvement today as we have been struggling lately. Our keeper was had a lot of good saves and the back line worked well stepping up catching the opposition off side. It was hard to hold a team with ten men especially in the first half when they were playing down the hill and we lost a lot of goals which some were our own fault. But we will build from today's positives ."